Another week quickly passes. This one was packed with work and a lot of Bike and Car stuff. I sold my 2003 Z1000 motorcycle, as I am getting in less and less time to ride, and still have an ample choice of bikes when I am ready. I sold an old set of Centerline wheels that have been laying around from the 67 Firebird that was sold last year. The new 71 corvette has some minor upholstery completed by my friend Jose at JB Custom Upholstery in Camarillo. He shaved down the new seat cushions allowing me to sit in the car, rather than sitting so high I felt like I was on top of the car. The fit is much better, but still not as good as the 75 Vette, so I will continue to determine the difference and seek the better feel. 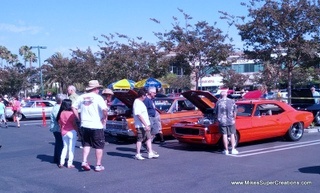 Spent a night in Simi Valley at the Wednesday Cruise Night event with the 71 Vette. Small turn-out, but always nice to get with other like-minded hot rodders. The 75 vette has been running great and has a new temporary home, since I am out of space. Also, updated this site this past week... and let us not forget the full week of work! I am blessed that I have so much work, but it takes its toll on me. O keep saying Bring It ON!